They're quick to set up, easy to manage, and can provide an astronomical return on investment if done properly. Wondering how you can get started with a contest today? This article will give you 50 fun contest ideas for 10 major industries - 5 specific ideas for each industry. I'll also include a few real-world contest examples for each, so you can see these contest ideas in action. Simply select your industry below (or scroll down to see them all!). We'd love to brainstorm fun contest ideas with you one-on-one! We've worked with hundreds of businesses from every industry, and run successful competitions in all of them. Book a time to chat with a contest expert today. When it comes to social media, women are the biggest sharers - responsible for 62% of total shares on Facebook. Women are also more talkative with their friends (rather than men, who tend to just put things on social media and leave them there, expecting acknowledgement). How is this relevant to your industry and contests, though? It means that you should be running referral and bonus entry contests - a competition idea which rewards your entrants with more chances to win whenever they share your contest with their friends. Women are more likely to share than men, and their friends are more likely to get involved in your contest (enter themselves, support their friends, vote, etc). In the process, your contest will increase in visibility and you'll get the contact information for more new prospective customers. These women's ecommerce contest examples were built with Wishpond. Our ready-made contest templates make building your next contest a matter of minutes. Click here to create an account and try out the builder today (no credit card required). Shopping Spree: Give away a gift card for your ecommerce site, but pitch it as a "Shopping spree." In your contest page, be sure to show exactly what people can buy with the gift card (rather than the gift card itself). Holiday/Seasonal sweepstakes: Give away a gift card or product based around the primary "buying" holidays and seasons (Black Friday, Cyber Monday, Christmas, Pre-Summer, Pre-Fall, etc). For an example of marketing on a holiday, check out some St. Patrick's Day Contest Ideas. 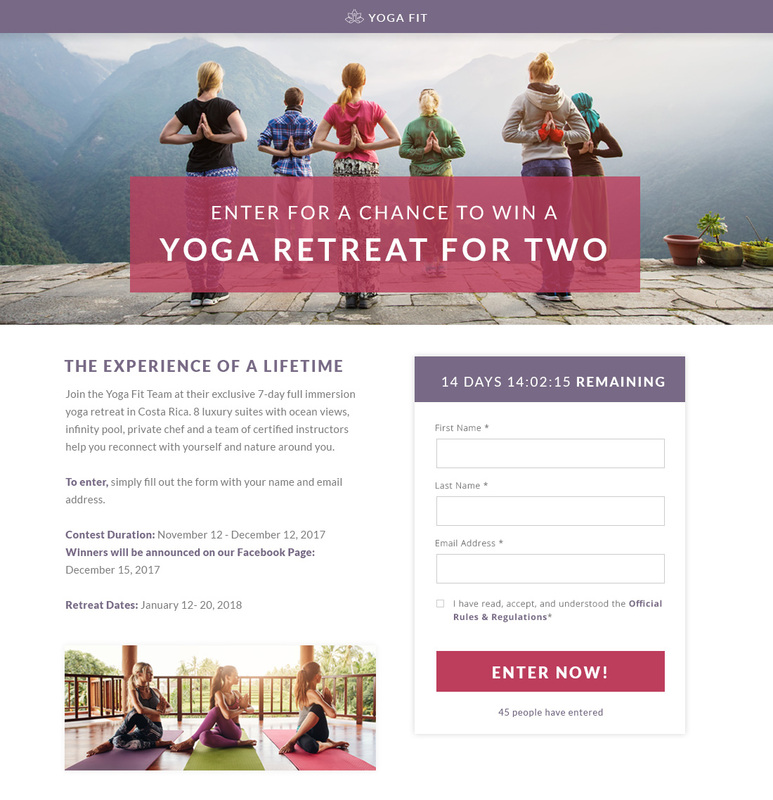 Partner up: Partner with a yoga studio or gym around New Year's and give away a complete workout outfit and 6-month membership. Alternatively, partner with another brand and give away a workout outfit alongside a mat, ball, etc. Promote to both brand's customer lists (yours and theirs) and you'll get their contacts as well. "Night-on-the-town" contest: Give away a complete "going out" outfit/gift card alongside two tickets to a show in your area. "Summer Swing" contest: Run a summer-themed contest which gives away a summer dress and accessories (or a gift card which can buy those things). Ecommerce is the #1 industry for running online contests, hands down. Your products make excellent prizes and your target market is tech-savvv and active on social media. Better yet, if someone makes one purchase from you, you're the industry most likely to make two. The mass majority of the contests we run are for ecommerce brands. And I highly encourage you to give them a shot. There's no better way to generate buzz about a new product, boost sales in the slow season, or get the details of new prospective customers (and all their friends). These ecommerce contest examples were built with Wishpond. Run a pre-winter contest giving away a gift card. Pitch your products as a "winter necessity." It doesn't matter what your products actually are, but how you portray them as relevant to what your entrants are already thinking about. Run a Valentine's Day contest giving away a "his and hers" package for Valentine's Day. Alternatively, give away a "Just for Her" prize on Mother's Day (or a "Just for Him" prize on Father's Day). Remember, with these contests, that your market is your usual target market's partner, family or friends (so target accordingly). 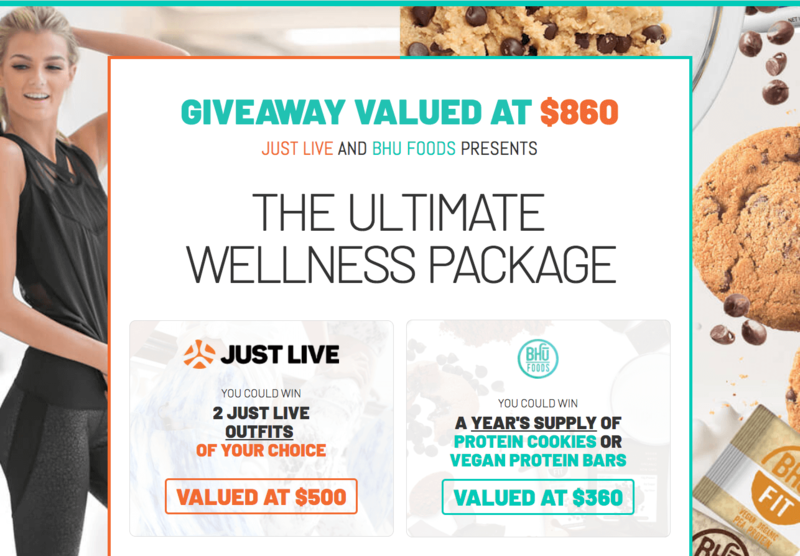 Run a contest which gives away a prize pack of your products. This improves the chance of someone being interested in at least one of the things you're giving away. Give away free shipping for a year. This is a great contest to give to 10 winners with the message "Get a chance to win every day for 10 days!" And it's particularly valuable because all you're doing is cutting into your profit margins, rather than giving away something completely free. 40% of men ages 18-to-34 "would ideally buy everything online" while only 33% of women say the same. It's even more prominent among teens. 86% of male teens say they shop online whereas only 76% of teen girls say they do. What does this mean for your next contest? It means that, when it comes to driving online sales, men are upsetting the stereotype. 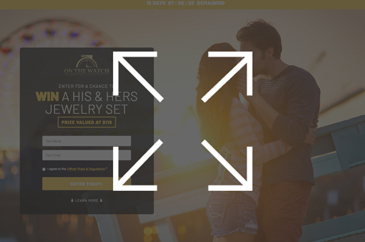 These men's ecommerce contest examples were built with Wishpond. Run a Father's Day contest to your normal target market's partners. Consider giving away one of your more expensive products, particularly if you're not going to give away a gift card. Partner with a barbershop in your area. Give a "manly makeover" with product prize package. Run a summer BBQ-themed contest, where you give away a (humorous or not) BBQ/summer party outfit. Also consider teaming up with another brand to give away a BBQ, fireworks, meat, etc. Give away a Groomsman gift package. Give away three or four product prize packages - items could include a watch, a tie, a flask, a satchel/messenger bag, a smoking jacket, etc. Run a themed contest. This could be anything from the Super Bowl to Christmas to National Hotdog Day. Get creative with your contest theme to drive sales in your slow season. The hospitality and spa industry has a strength which none of the other industries have: a super valuable product. A two-night stay or spa day are contest prizes which result in huge numbers of contest entrants. They're also a really exciting thing to win because they're such luxuries. Sure, it's great to win a new vacuum or outfit, but a romantic getaway for two - away from the kids and in a location they wouldn't normally see? That's a prize you really want to win. Top Tip: Whenever you run a contest, you need to be considering how you're going to convert those entrants who didn't win. We recently had a client who gave all their entrants a secondary offer via email - 30% off their first booking - which resulted in a huge return on their contest investment. These hospitality/spa contest examples were built with Wishpond. A two-night stay. Be sure to give a reason: Valentine's Day, Father's/Mother's Day, etc. A free upgrade to your President's Suite (or equivalent). Pair with "You deserve it!" messaging. Partner with a restaurant, spa or theater in your area. Give a romantic weekend getaway for two. Give away a "Girls Weekend" spa day. When you're creating Facebook Ads for this contest, try creating an ad set targeting the boyfriends/husbands of your target market. Give away 7 deep tissue/Swedish massages. To increase the perceived possibility of any given entrant winning, give away a massage every day for a week. There's no beating around the bush here: we run more fitness contests than any other industry except ecommerce. 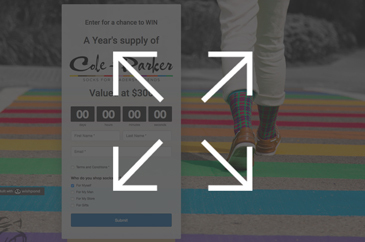 Your industry is absolutely perfect for contests (which I, unfortunately, can't say for B2B). You have clearly valuable prizes: 6-month membership, free personal training, whatever. You have the benefit of a lot of great visuals, and price is one of the main pain-points in your industry. When you tell someone they can get fit and healthy for free? The perceived value is priceless. Any contest you run needs to have what we call a value proposition - the reason that people see your as valuable. But it can't just be "get 50% off" or "get your first month free". Instead, you should consider the emotional value of your offer. For instance, "Get ready for summer," "Burn those Christmas calories," "We'll help you stick to your resolution" etc. These fitness contest examples were built with Wishpond. Free membership for brides. Facebook advertising will enable you to only show your contest to women who are engaged. You can also target female friends of engaged people. Free workout and healthy-eating plan. This is also a great option to add to our website as a "lead magnet" - a free giveaway which you deliver to people when they submit their contact information. Create a series of emails (also called an email drip campaign) which are designed to turn your new contacts into paying customers. Free personal training. Personal training, unlike a general gym membership, feels like a luxury (with higher perceived value). Be sure to add the dollar value of personal training into your value proposition/contest headline. "Spin with the girls!" Consider giving away a pack of spin class passes (10), enabling girls to bring their friends to multiple sessions. This is an especially valuable contest for you as, when your winner's friends enjoy spin class, they're likely to pay full price down the line. Free 12-month membership. Only consider a full free membership if you're running a bonus entry contest as you'll need to generate a lot of prospective customers to make the giveaway worth it. The last thing you want is to give away a $1,200 prize and only have two entrants. The honest answer here is that we don't run that many B2B contests. And that's because, in general, there's usually a better way for your business to find the results you want. However, there is a single type of contest which I can confidently recommend, and it's one we've used to great success many times over the years. This is a partnered contest. And (again, to be totally honest) it's a super valuable campaign not because you're going to go viral on social media, but because when you notify your existing lists about the contest, you'll be legitimately trading contacts with a business similar to your own. To learn more about partnered campaigns (and how we've used them), check out "A Behind-the-Scenes Look at How We Generated 1,263 New Leads (With a Little Help from Our Friends)." This B2B contest example was built with Wishpond. Partner with another business. Give a year's subscription to both your service/platform and theirs. Be sure to find a business which not only has the same target market as you, but also compatible products. Run an internal contest (within your office/branches) giving away a gift basket or swag. Internal contests can be a great way to boost company morale. Black Friday/Cyber Monday discount plan. If you're going to run a discount plan promotion, consider giving it to "10 lucky winners" - because you're going to be competing with other SaaS/B2B companies who simply run sales. Honestly my recommendation would be to just run a sale, rather than a contest, here. If you're an office supplier, give away free shipping for a year. Consider running this as a month-long promotion and it's exclusively available to first-time buyers. Sports team sponsorship. A contest where you give away sponsorship of a local youth team gets your name out there. Just don't expect it to drive final sales. 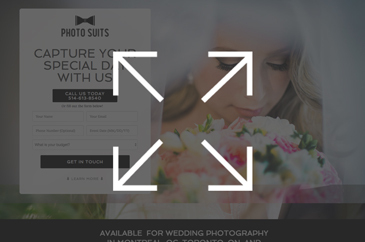 If you're like most photography businesses, you get most of your clients through word of mouth. They ask a friend if they know any good photographers, you're mentioned, and the rest is history. Contests, however, are like word-of-mouth marketing on speed. Online contests are, by definition, online. And that means that information, recommendations and references can be shared and disseminated at lightning speed and shared with huge numbers of people. Your target customer has 100 friends who are also your target customer. Contests, especially bonus entry and referral contests, are a fantastic way to reach all of them. These photography contest examples were built with Wishpond. Give away a wedding package in the Fall. Be sure to time your contests correctly to engage with the maximum number of people who might be interested in your prize. Most people who are having late Spring/Summer weddings are planning their photographer in late Fall. Give away a new baby photoshoot. Similarly to the above, you should know that most babies (in North America) are born around September. Give away free photo framing. Do this for the first 10 booked photo shoots, then offer 50% off to everyone who books after the first ten. Run a contest which gives away a "Friend's Day" photoshoot with costumes. Run a photo contest where one entrant can submit a photo and get their friends and family to vote on it (they'll need to submit their contact information to vote). Partner with a hairdresser or makeup artist. Give away a photoshoot with makeover package. If you photograph weddings, it should be easy to connect with makeup/hairdressers before the wedding. Most restaurants don't think about online marketing too much. Much of your business comes from word of mouth and (if anything) review sites and Google search. Nonetheless, a good contest is one of the best ways for a new restaurant (or one looking to increase declining patronage) to get people in the door. Note: A contest is also a powerful way to get people to review your restaurant online. With a bit of help from our fully-managed team, you can use Wishpond's bonus entry contest builder to give extra chances to win to those contest entrants who review your restaurant on the platform of your choice. Just be sure you only target people within your area. Online marketing is powerful in its ability to give businesses huge reach, but it can also be dangerous. Be sure you're not spending money or resources to reach people who are nowhere near your restaurant. These restaurant contest examples were built with Wishpond. Reach out to a hotel in your area. Give away a romantic weekend away, with your restaurant giving a three-course dinner and bottle of wine. Is there a popular movie coming out? Buy tickets and give away a date night. "Get Away from the Kids." While this is, ostensibly, just free dinner, the most successful contests are always those which tie into a well-recognized idea or theme. Consider running this contest in the middle of the summer, targeting parents with children who are on Summer break. Give away a Thanksgiving dinner. Cater a family's Thanksgiving dinner with all the fixings. A cool idea for this (if you want to take it a step beyond, would be to give away a free dinner for the contest winner as well as a needy family in your area. Create and give away a Superbowl party pack. My recommendation for this would be to make a big deal out of the winner. Have your chef, restaurant owner and waiters/waitresses pull up in a van and deliver the Superbowl food in person. Take some photos with the winners (and their friends) and post them on social media. Contests can actually be a very valuable marketing strategy for the dental/cosmetic medical industry. 1. Your services are expensive, so a prize has a high dollar value. This increases the number of entrants you'll likely get. 2. People who enter your contest will think of your business the next time they need your services (even if they don't win). 3. The people who do win will return to your business (if their experience is good) for any follow-up care or with a family member. It's far easier to keep going to a dentist or cosmetic surgeon you like than find a new one you don't know anything about. Top Tip: My recommendation is to have multiple winners for your dental/cosmetic medical contest. It increases your entrant's belief that they'll win (which increases entry rates) and you'll get more people through the door who will become loyal clients. These dental/cosmetic medical contest examples were built with Wishpond. Give away dental care or cosmetic medical treatment before Valentine's Day. My recommendation would be to create two contest pages - one which targets men ("Surprise her on Valentine's Day!)" and one which targets her ("Give him a surprise on Valentine's Day!"). Target engaged women on Facebook. Give a pre-wedding treatment (teeth whitening, wrinkle removal, etc) up to your selected dollar value. Run a "back-to-school" or "before University" contest giving free dental treatment. Target parents of 8-18 year olds around August. Consider two different contest pages: one with a young child smiling and one with an older teenager. Give away a "Golden Years" cosmetic treatment. Target men and women on Facebook who are 55+ to be sure you don't waste your money. Run a contest teeth whitening treatment. Consider running a standard contest like this a few times a year. Just be sure to exclude your previous contest entrants from your target audience on Facebook. Want to learn more about Facebook Ads? We wrote a complete guide to Facebook Ads last year with everything you need to know. Check it out! The auto industry is one of those industries which hasn't fully embraced online marketing as a viable way for them to succeed. For you, then (someone within that industry who recognizes how powerful online marketing can be) the opportunities are massive. Did you know that Facebook enables you to target, specifically, people who own a certain type of vehicle in your area? Can you imagine how powerful that would be if you owned a Subaru, Mitsubishi or Volkswagen auto shop? But let's not get ahead of ourselves. We're talking online contests here. Before the winter comes around, many of us consider winterizing our vehicles. We're perusing Facebook as we normally do and "Bam!" an auto shop near me is giving away free vehicle winterizing. Or I'm looking to go on a family road trip for an upcoming long weekend. "Bam!" my friend shares with me an auto shop giving away a complete vehicle checkup for free. These auto industry contest examples were built with Wishpond. Give away a free tire rotation or a new set of tires. This is the standard "product prize" for the auto industry (rather than some of the more complicated campaigns or prizes). This kind of giveaway/sweepstakes can be run as many times per year as you like. Just remember to exclude your previous campaign's entrants from your targeting and email mailout. Give away a vehicle checkup before roadtrip season. My recommendation would be to run a summer-oriented online contest around May to tap into what people are already thinking about. Give away a free vehicle rental. Again, run this campaign before a major long weekend to increase the chance of your prospective customers needing your prize. At the end of the roadtrip/travel season, give away windshield repair. My recommendation would be to give this to 10 lucky winners over the course of 10 days. This increases the perceived chance to win and gets more people to enter. There you have it, 50 contest & competition ideas to try out for your business. See anything that intrigues you? Or do you have some creative contest ideas that you've already put to use? 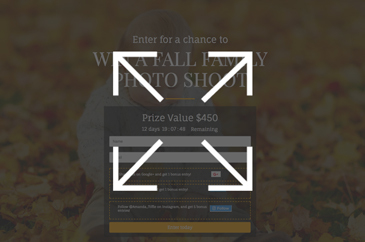 All of the examples in this article were created using Wishpond's easy-to-use contest builder. Get started building your own campaign with our 14-day free trial.